Say the word “gentrification” in a room of community development practicioners and you’re likely to get a cacophony of responses. Alan Mallach sparked a debate over the word on our blog in a piece in which he offered an alternative to Project Rebuild and NSP. The federal programs aren’t effective, Mallach contends, and a better solution is to offer tax credits to encourage investment in flailing neighborhoods. 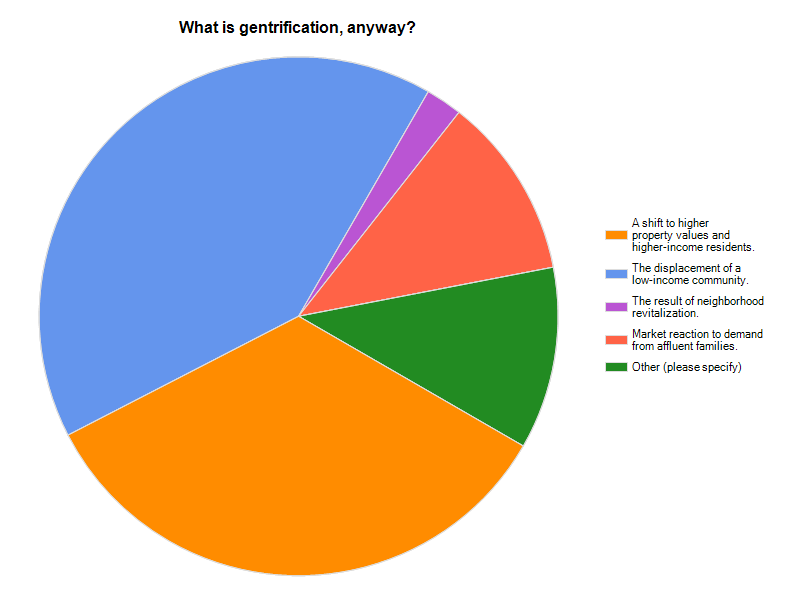 But readers had questions: What about gentrification? Is displacement inevitable (and sometimes even good)? How does this affect the social ownership of a neighborhood? A few weeks ago, you also had to chance to weigh in on the word in our weekly poll. Respondents were able to choose more than one answer. “The term has come to take on a broader meaning in the minds of many, particularly residents who have seen change come to their neighborhoods. Residents in areas stagnate or in slow decay for many years are very unsettled regardless of economic benefit or loss when faced with rapid transformation. It is shocking and will always result in backlash/pushback. To scream gentrification whether appropriate by definition or not diverts attention from what is important. Investment and development is good and should be encouraged at any income level or speed. The key is to ensure the benefits are shared by all. Labeling high-end development as inappropriate for some areas is misguided. It is in the administration or application of that investment from which inequalities result. Investment from any institution, gov’t, bank, speculator etc… should be encouraged equally, but have the same rules and guidelines applied to all. It is done successfully in free markets around the world, including here and can be done with will and determination.” —Stan C.
What causes so much debate—the clashing opinions on the effects of gentrification or the definition of the word itself? Share your thoughts in the comments, or take the survey here.